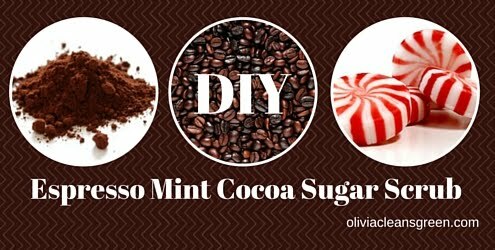 Nothing says Happy Holidays like this delicious smelling DIY Chocolate Espresso Mint Cookie Sugar Scrub. This all natural scrub is a yummy treat for skin damaged by winter weather. Almond oil is moisturizing. Sugar and ground coffee exfoliate dry skin. Chocolate, coffee, and vanilla are rich in antioxidants, which help prevent and repair damaged skin cells. Honey is a humectant, so it actually draws moisture to your skin and keeps it there. Peppermint oil perks up your mood, chasing away the winter blues. This bath and shower-friendly scrub is also great for use after washing your hands.